Every textile, fibre, or yarn that moves through my hands sparks a thought, a memory, an emotion or a flight of imagination. I get lost and my mind wanders, following the thread . . . . . . 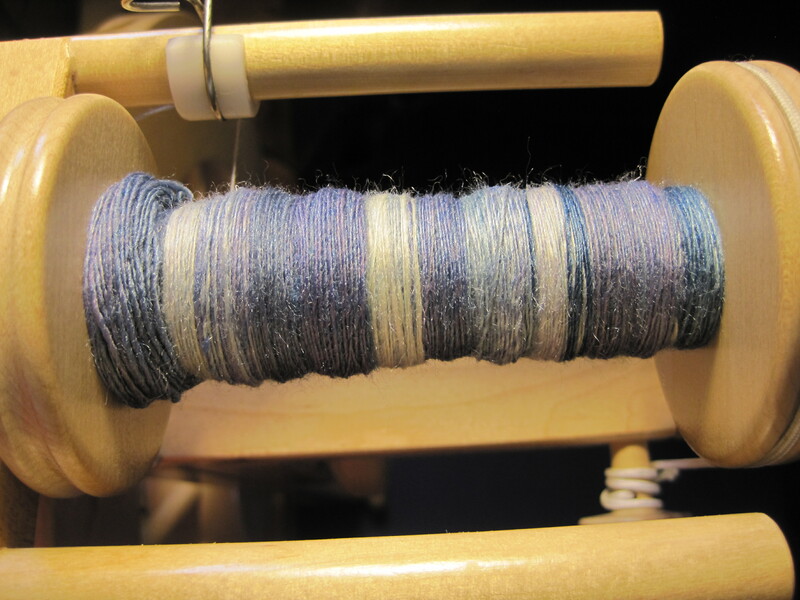 I have been spinning again. This beautiful pile of fluff was blended and dyed by Lynne at West Coast Colour. Lynne loves to work in fibre and names her fibre blends. This one, called “Satisfaction”, is a blend of 60% Polwarth wool, and 40% silk. 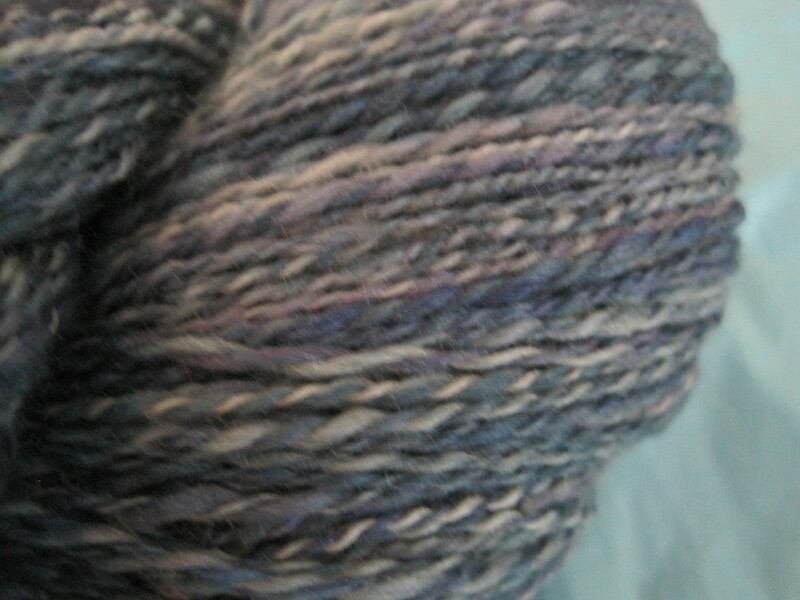 While Lynne names her fibre blends, I like to name the colour story. Not when the fibre first comes to me, not while it is on the stash shelf, but as I start to spin and draw out the fibre, the name and the story start to evolve. 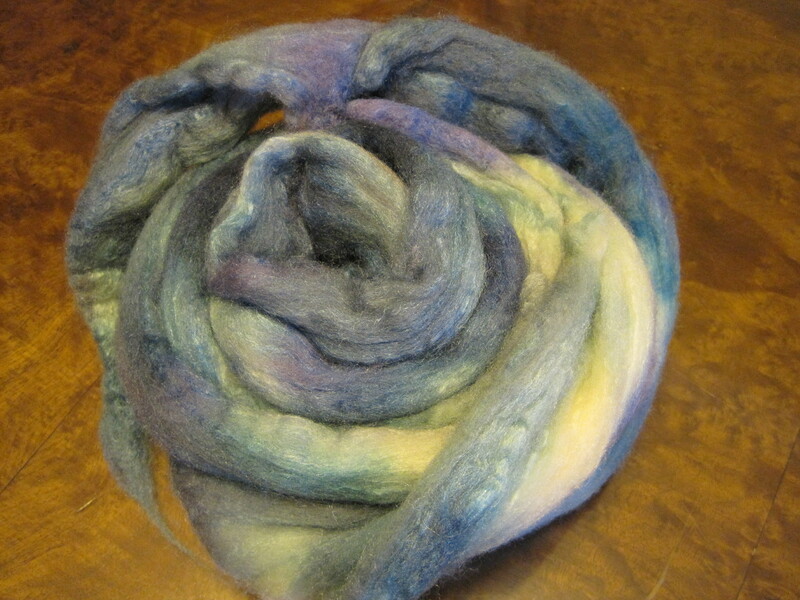 This fibre is dyed with blues and a hint of purple, and as I worked it started to remind me of a pile of blue jeans on the floor, some darkly new, and others old and soft and faded to nearly white. And so, my mind wanders to denim dreaming. I started to think about myself and what blue jeans have meant to me throughout my life. When I first noticed and wanted blue jeans as a child, my mother insisted that jeans were the uniform of farmers and cowboys. OK to wear while working in the house and garden, but never to be worn into town! When going to town, dresses and leather shoes were the only respectable clothing. I spun a fine thread of blues and thought some more. High school meant wearing a school uniform every day (kilt, white blouse and knee socks). Weekends meant blue jeans and freedom. I remember slitting the sides of my jeans and inserting large wedges of patterned fabric into the opening and now they were bell-bottoms. Accessories were fringed vests, felt hats, and love beads. The soundtrack of the “Mammas and Pappas”, “James Taylor”, “Carol King” and “Sonny and Cher” was heard in the background. Still I spun the pile of blues, and moved on to university, first time away from home, and denims became a uniform of a different nature. These jeans clothed me through learning about the larger world: civil rights, philosophy, world religions, cultural differences, war and peaceful protests. My mind was opened up to new thoughts and philosophies and optimism that my generation could change the world. In my twenties my jeans morphed into Mom Jeans and family responsibilities. Oh, how I loved these days: playing in the park with the kids, exploring tadpole pools, piling up and jumping in the autumn leaves, snowball fights and building snowmen in the winter, bike rides and swings in the spring, baseball, beaches and bar-b-ques in the summer. These days passed oh so quickly, fast as life. My second bobbin of yarn was filling up. 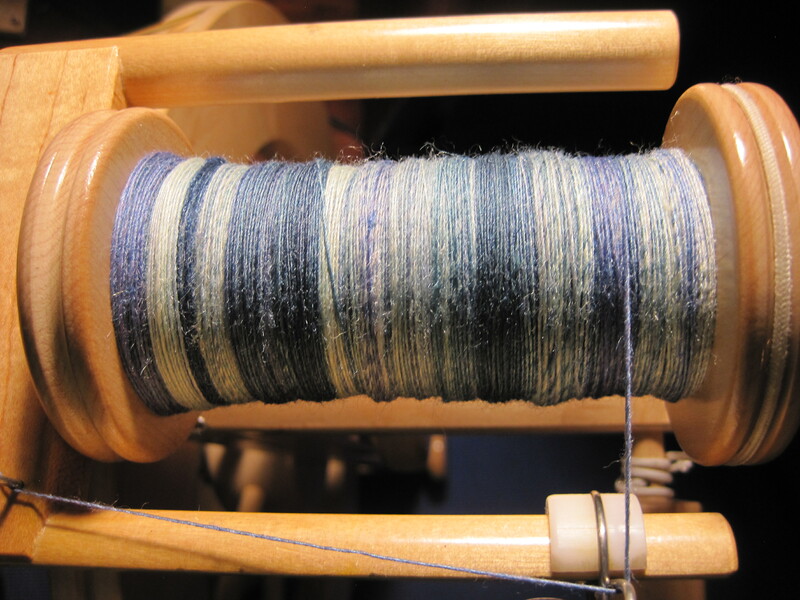 On to the plying, the colours now coming together in a patchwork of blue. Now what do I wear? Old lady jeans? Maybe. But like a favourite pair of well-worn jeans I am softer, paler, a little torn and patched, but oh, so comfortable in myself, in my own skin. I fit. 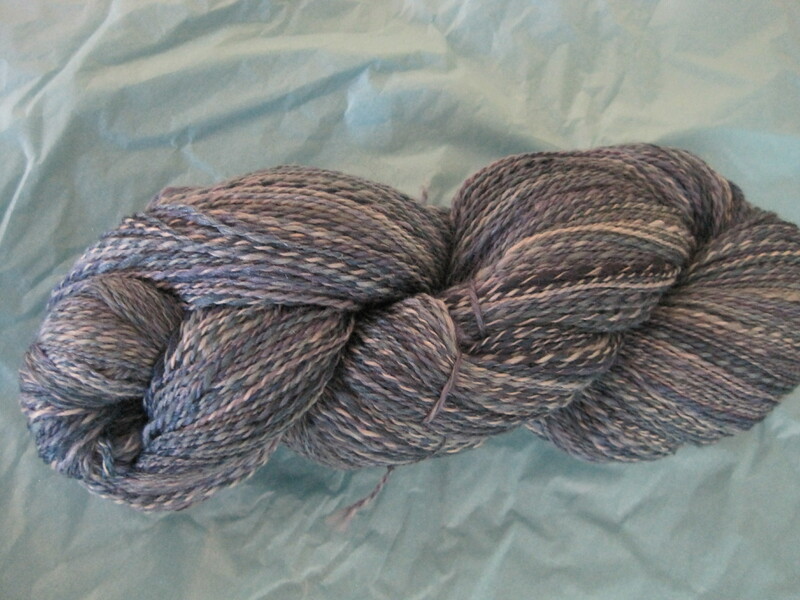 This 119 gm skein of “Denim Dreams” is 557 yards long, and took 14 hours to spin – lots of time for dreaming. I plan to weave a comfortable scarf or shawl to wear with my jeans. 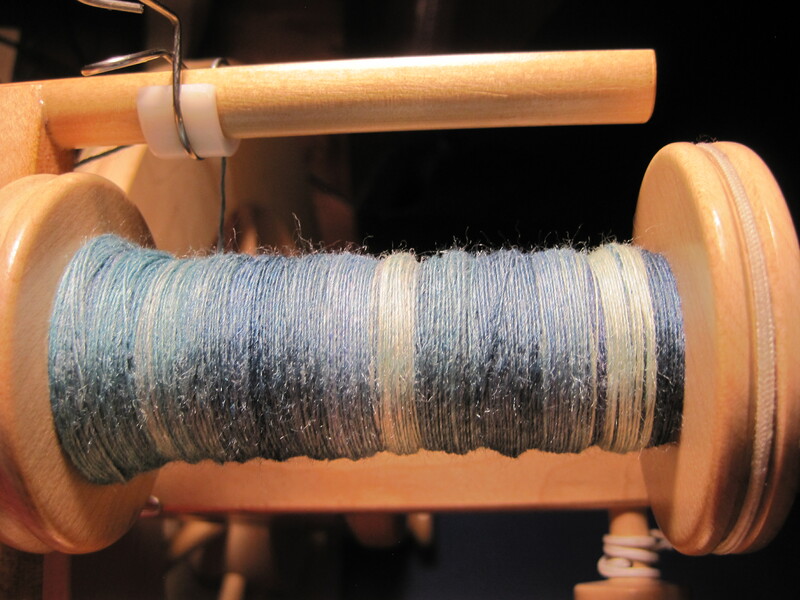 This entry was posted in Essays, Spinning and tagged blue jeans, blues, colour, denim, dreaming, handspun, life reflections, Spinning, Spinning wheel, Textile, Wool, yarn. Bookmark the permalink. Thanks, Vicki, I’m just waiting for my loom to be free. It’s amazing how the wearing of denim has changed for women over the years. So true, Barb, clothing affects how we think and feel about ourselves, and changes over time and culture.